A new study showcases the dominance of "freemium" titles on Apple's iOS platform, as in-app purchases made through free apps accounted for 71 percent of total iPhone app revenue in the month of February. The statistics published this week by analysis firm Distimo show that paid applications were responsible for just 24 percent of total iPhone app revenue in February. The remaining 5 percent came from in-app purchases done through paid applications. Unsurprisingly, the biggest earners among "freemium" iPhone apps are games, with Clash of Clans taking the top spot for February. The only non-game to crack the top 10 was TurboTax SnapTax, which took tenth place ahead of the coming U.S. tax deadline. The average revenue per device among the top 10 apps ranges widely, from What's the Word earning 37 cents, to Rage of Bahamut taking in $7.04 per device. Among the top 250 grossing iPhone apps, 170 are free with in-app purchases, while 53 are paid with in-app purchases. The remaining 27 applications are paid-only. Broken down by country, users in Japan spend the most on in-app purchases, with an average of more than $3 per title downloaded. Distimo even excluded Puzzles & Dragons, the No. 1 grossing app in Japan, as it would have skewed the results and driven the average revenue per device in that country even higher. 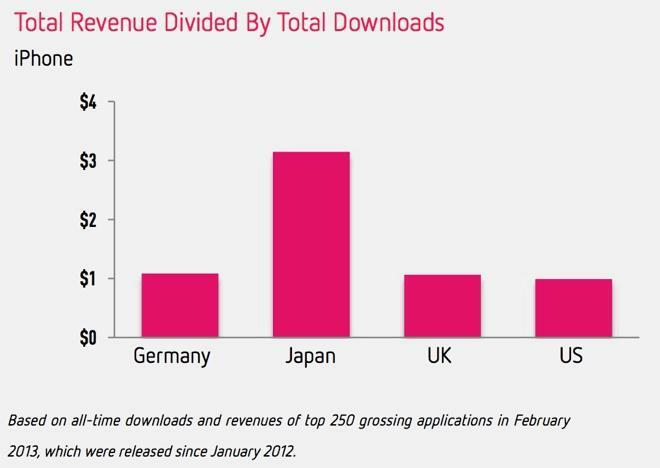 In comparison, the U.S., U.K., and Germany all spend about $1 per download on average, meaning the average download in Japan is worth more than those three countries combined, excluding Japan's most popular title. 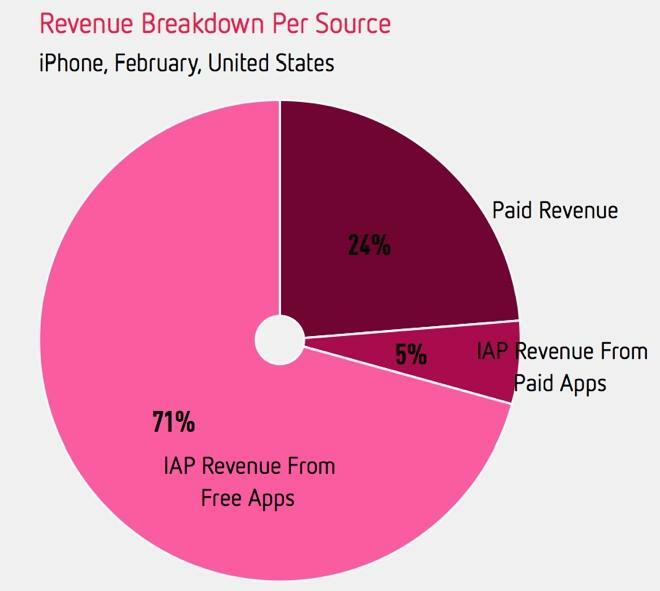 While "freemium" apps account for the most revenue, they also generate less revenue per download than a paid application, through which a developer collects money up front. "Freemium" titles have been a source of controversy, as they are frequently downloaded by children who can rack up charges on their parents' App Store account. That prompted Apple to add a notice last week highlighting when a free application includes in-app purchases. Apple was even sued in 2011 and was accused of collecting "millions of dollars" from unauthorized in-app purchases made by children. Apple settled the case earlier this year and offered $5 iTunes credits to the complainants.